"Simulated live" is a type of video broadcast that keeps every online attendee in sync. In a simulated-live, or sim-live, event, attendees join the event in progress at the same time, just like attendees in a physical service. So, if your event starts at 2:00 p.m., and an attendee logs on at 2:05 p.m., they&apos;ll join the service five minutes in. This is important to Church Online because it creates a cohesive community even though people are separated by computer screens. No matter where they&apos;re watching from, they can watch, chat about, and react to the same content at the same time. 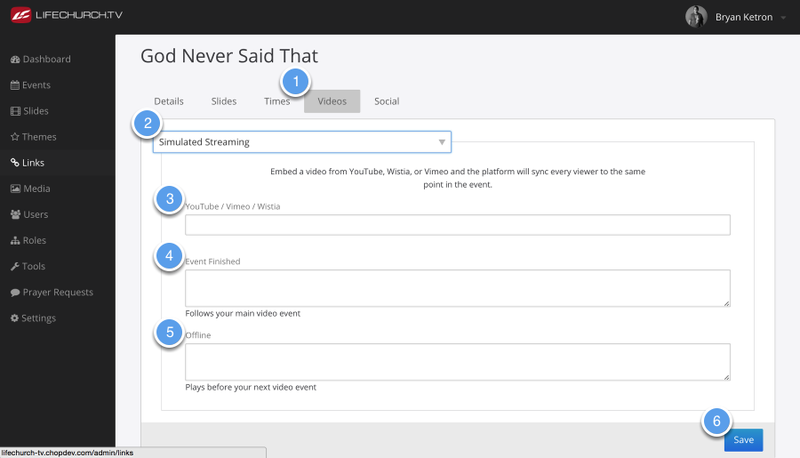 With YouTube, Vimeo, and Wistia, sim-live is now built into the Church Online Platform. From the Admin, you will need to navigate to the "Events" tab to display your events. To access the simulated streaming page, you can either create a new Event by going to "+Add Event" or you go into the event editor by selecting "Edit"
There are two options you can select to setup streaming, you will need to select the "Simulated Streaming" tab. YouTube, Vimeo, Wistia - here you will enter either the URL or the embed code that is provided for you from YouTube, Vimeo, or Wistia. Event Finished - you can add any embed. This video will immediately follow your main video event and will be played automatically. Offline - Embed content here for when your stream is not live. This is often a pre-recorded piece that is used to promote your event. You can use YouTube or Vimeo for free to host a video. Graphics are also commonly embedded here. Be sure and "Save" your event.